Want to request some money from your loved one staying abroad? Just send a simple SMS to them. Now use RemitGuru's 'Request Money via SMS' option from anywhere and at any time, even without internet access. Simply SMS the below details to '9289200028' and your request will be forwarded to your loved ones living abroad. Once they accept the request, the money will be delivered straight into your bank account seamlessly. How to use the 'Request Money via SMS' feature? It is very simple. You do not need to get register and do not require any internet connection. All you need to do is, send an SMS to '9289200028' in the format mentioned below. 1.Currency Code: This is the ISO code for the currency in which the money will be sent. For eg., if the sender lives in the UK, the currency code will be GBP. If the sender lives in Germany, the currency code will be EUR. 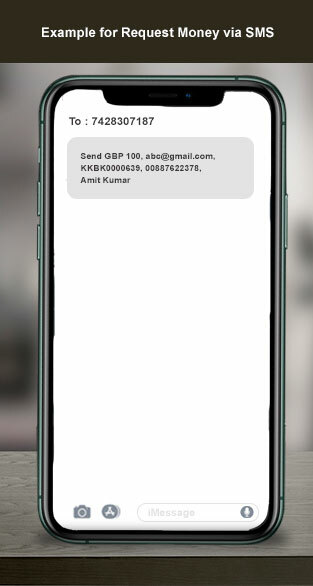 2.Sender's email id: Email id of the person residing abroad that you want to request money from. 3.Your IFSC Code: This is the IFSC code of the bank account where you want to receive money. 4.Your account number: Again, details of the account where you want to receive money. 5.Your Personal Detail: Your full name. Commands are not case sensitive -- you can text us in lowercase or capital letters.